What sticks in my mind most in January was the incredible cold. Most of the Gulf coast and deep South woke up on the morning of the 17th to sub-zero temperatures which cancelled flights, disrupted traffic and closed schools and businesses. The blast of cold air shattered records early Wednesday (the 17th) in Louisiana and Mississippi. In Houston, the nation’s fourth most populous city, most freeways were closed on the morning of the 17th after icing over, the city’s Office of Emergency Management said. It was the second time already in 2018 freeze warnings had been issued for deep south and the Gulf Coast. Hattiesburg, Mississippi, also broke temperature records with 12 degrees Fahrenheit on Wednesday the 17th, beating its 14 degrees also set in 1977. 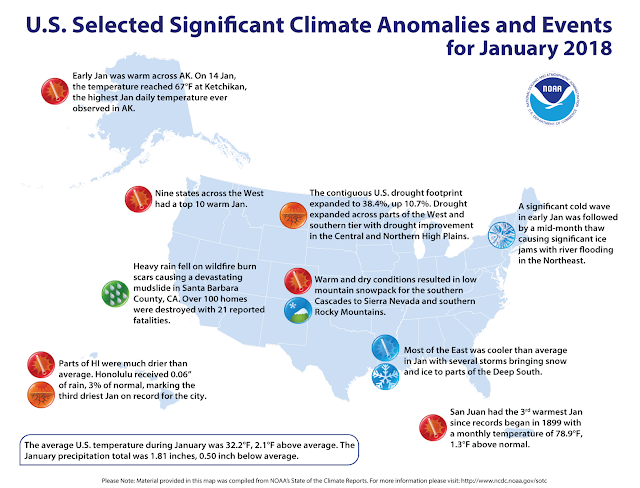 The US has had a tough start in 2018, with some parts considered colder than Mars and the North Pole in January. Remarkable stat's were being banded around. Low temperatures in the minus 40 deg F (-40 deg C) had been recorded in northern Minnesota in January. According to the Weather Channel, New Year's weekend in the Plains, Midwest, South and East, shattered many daily cold records into the first days of 2018. With temperatures colder than domestic freezers, data from the Curiosity Rover, which is roaming the red planet, showed temperatures on Mars reached a comparatively balmy -23C on January 20, and with temperatures around -21 deg C or lower the North Pole has been actually warmer than parts of the US in January. no surprise here this always happens at this point in the sun spot cycle. Don't panic little global warming chicken littles!